My sons just spent their last days in my house as single men(!). We had a great family potluck shower at my sister’s and now the weddings are becoming a reality. Decisions need to be made, etc., etc., etc. July Fashion Sewing Club will reveal a few dresses as options for the mother of the groom but I’ve got to admit that Nordstrom’s is my fall back. Club meetings begin this Thursday at Associated Sewing in Bloomington (10:30 and 6:30) and Saturday at 10:30. You may want to take in the Eagle Creek Garage Sale in Shakopee on Saturday (9 am-2 pm) after Club. 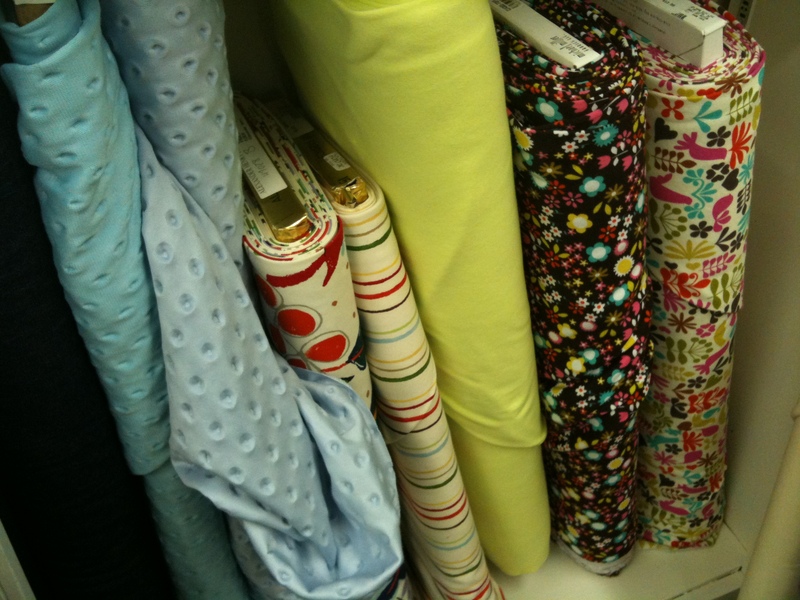 I haven’t been for a few years but I remember some great vintage notions and fabric. Click here to go to the website. On Tuesday, we’ll be at Treadle Yard Goods (10:30 and 6:30). Their big summer sale goes from July 8-18. Some of their dress silks are on my MOG dress list. We’ve had a few requests to hold Fashion Sewing Club at The Sampler (551 W. 78th St.) in Chanhassen, so this is our trial month. Wednesday, July 14th we’ll have our meeting at 6:30 pm only, but we will have it no matter what. We’d like to see eight people to continue the meetings into the fall. Email us or call The Sampler (934-5307) to let them know you’ll be there. Bring your friends-first timers are free (at any meeting). 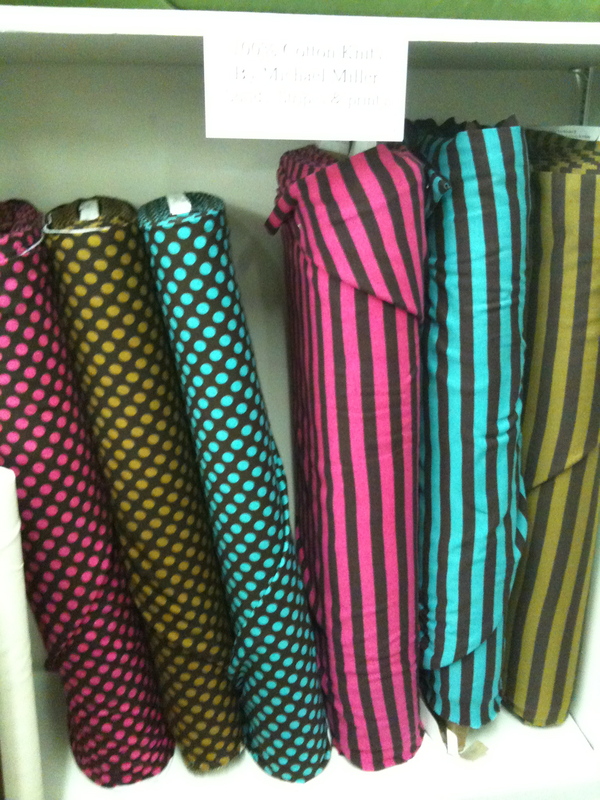 The store is starting to carry more fashion fabric so support them if you want great fabric in a west metro location. 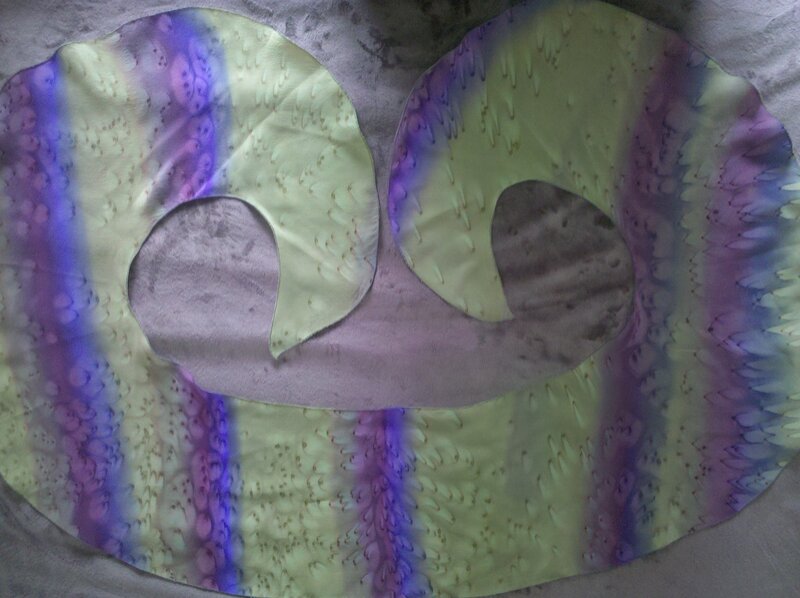 Pics of some of the fabrics are below. Remember Kathy’s scarf from last month? Here is a picture of it laid out. It’s a 32″x22″ rectangle and 7″ wide until it goes down to the points. Hopefully we’ll see a few from the serger class at Club meetings this month. 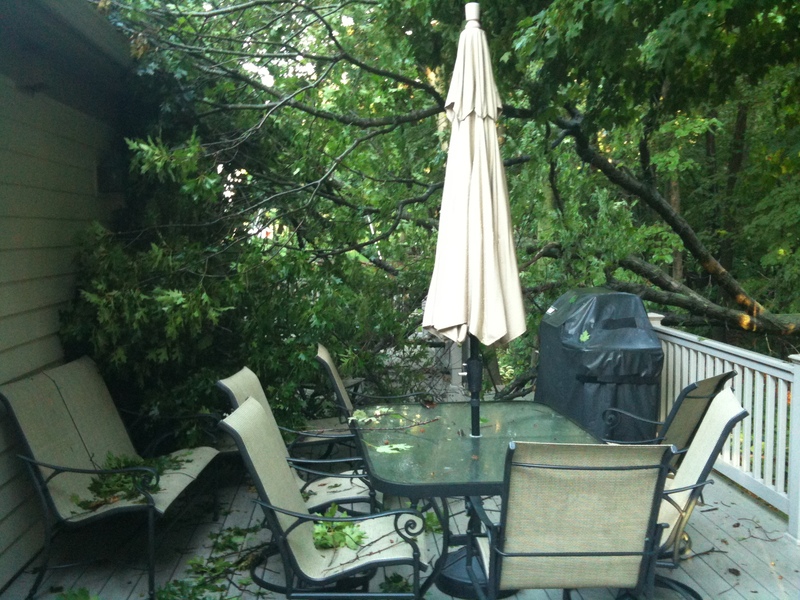 And then there’s the half of an oak tree that fell on my deck last night. No one woke up, no holes in the roof or broken railings-at least as far as we can tell at this point. Someone is coming later this afternoon to get the tree off so we can look more closely. Life is never boring! One last clean up detail-last month Sarah Tufford told us about a group in the Madison, Wisconsin area. New homes are found for sewing machines that still work, and in the process gives new hope for the future to poor people. They sew for themselves, their families, and to make a little money to live on. Here’s the website: thesewingmachineproject.org. Some of us have been thinking about a trip to Gayfeathers in Madison and a trunkful of donated sewing machines would be a great impetus! Any takers? If you’re looking for a sewing related getaway, you may want to consider the Sewing Expo in Novi, Michigan. What if we got a group going together? Novi is supposed to be THE expo for fashion sewing. Here’s the link to the registration: americansewingexpo.com. The dates are Sept. 24-26. Well, that’s all for now folks. I better get back to my sewing. The tree is being removed piece by piece (and distracting me just a wee bit). Every once in a while everything shakes as it falls more and more! Glad I slept through it. 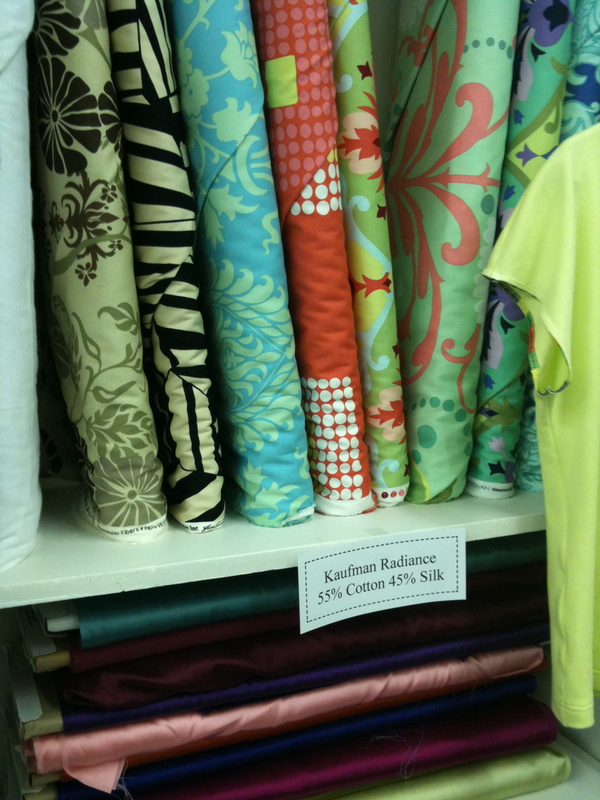 Posted on July 6, 2010 by KristinPosted in Events, Fabric, Fashion Sewing Club, Photos, Places to go, Sales, Schedules, UncategorizedTagged Eagle Creek Quilt Shop, Fashion Sewing Club, Gayfeathers, Novi Sewing Expo, The Sampler, Treadle Yard Goods. Next Next post: What’s your favorite tee pattern?